Discussion in 'The Small Company Luthiers' started by mikealpine, May 8, 2016. Entering the "boutique" realm, looking at various electric guitar builders that sell through dealers, and some who will do that as well as sell directly to the end purchaser. I am familiar with the MAP concept. I also know that, in cases like Taylor guitars which has an MAP policy, retailers have a certain amount of pricing flexibility, and there is some percentage that a buyer can negotiate off of the MAP to a "street" price. Is that something that is done in the Thornton, Grosh, K-Line, [name your builder] arena when working with a dealer, or even with the builder? I would expect the builder, if purchasing directly, might want to hold firm to protect the dealer network, but again, not really sure. Can you wiser, more experience folks offer insight? I don't want to offend anyone going in, and I realize I can simply try to negotiate with whomever I choose to purchase from and see what happens, just looking for what has been customary in this market. This is not the definitive word, but as far as I can tell the discounts on new guitars from boutique builders tend to be around ten percent off MSRP. I, however, tend to buy the boutique brands used, and suspect (and it seems from my experience may be true) those who own boutique guitars tend to take perhaps better care of them than owners of the more mainstream brands (a generalization, however, that certainly has numerous exceptions). So, the used boutique electric guitars I have purchased, e.g., those by Suhr, Grosh, Huber, Malinoski, Teye, Tyler, Tom Anderson, among others, have all been in excellent to mint condition. But there is something special about having a new guitar built to your specs, but as above don't expect a Taylor-like discount on them. Thanks Jay. I'm definitely not against buying used, specifically for the reasons you mentioned, however I have a pretty specific set of specs I am looking for in terms of neck and pickups and such, and I haven't seen anything like it offered. I definitely don't expect a big discount, am just curious about the "typical" amount of wiggle room. I appreciate it. Don't ever buy from me if you want mint, though. I play my guitars. Hard. Thanks, lol, I respect that! I'm not even looking for "mint", just a specific set of specs. I wanted a specific set of specs for a Grosh Electrajet. I put a WTB ad in the emporium and got one that was even better than I had hoped. The guitar came to me in brand new condition and sounds and feels better than anything I've ever played. I payed about 60% of what it would cost new. Just be patient and have money ready to buy! fishleehooker and mikealpine like this. Very cool, didn't think about a WTB ad. Funny...strongly considering an Electrajet, looking into the ElectroSonis pickups. 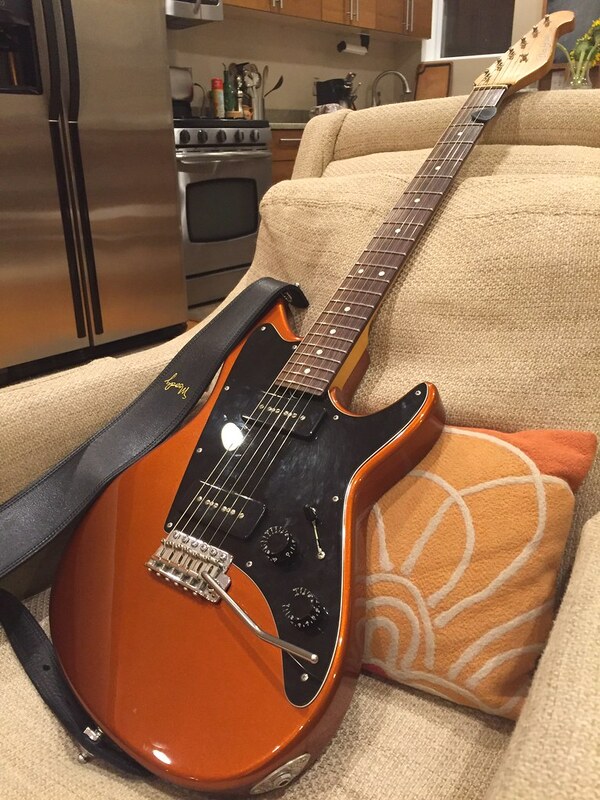 Dealers will definitely sell you a guitar at a discount. Just make an offer and they will likely accept. The only thing they cant do it promote a price below MAP. It depends on if the guitar you want is a stocked guitar or if you actually need to custom it. You can always change the pickups. I'm pretty sure the Electrasonics would drop into any of the P90 pick guards. What other custom details are you looking for? You don't find too much variation among Grosh's. If you like the Med/Large round back and a 1 5/8" nut, you'll have your pick. They're by far the most common. It's a fantastic neck. I've owned a few different Grosh neck sizes and it's my favorite by a long shot. It's actually become my favorite of any guitar maker that I've tried so far. boo radley and mikealpine like this. I have an e-mail in to Grosh with a few questions. I didn't think to ask if the ElectroSonics are drop-in replacements for the P90, but will. Thanks for leading me to that. I also asked if he produces a non-trem version, but I guess I can also simply never use the trem if I don't want it. Even so, I can still try to negotiate something, especially if I am good with an in-stock instrument from whatever builder. Thanks!! The good news is, that I've never played a Grosh that was anything short of spectacular. And I've owned 10 different ones!!! Even at new prices they are worth every penny. My Electrajet is never going anywhere... It's my favorite modern take on vintage styling. You want the trem! You NEED the trem! My EJ is my #1 by a lot. But I never user the tremolo! Ok...maybe I can learn. But, is there a downside to getting the trem and never even using it? Can I just leave the arm out and treat it as if I don't even have a trem? Yeah, I mean, I guess you could deck the trem, and tighten the springs so it never moves. But, then it wouldn't be all wiggly! Yes. And electrajets come with the trems flat against the body. Just take off the back cover and tighten the springs a little so the trem never lifts when you bend. At that point you are losing nothing but always have the option to use the trem in the future. I don't use tremolo bars. When I have my tech do setups I just ask him to de-activate (or "block") the tremolo on my guitars. Nothing lost. Is that metallic copper? I'd be thinking that or the metallic black cherry. That's beautiful! And I may try the trem, but if I really don't use it or it gets in my way, I'll have it blocked. Suddenly this is exciting! You Grosh people are serious enablers!! Someone offered me a Black Cherry one for something like $1500 recently. Do you want me to put you in touch with them?